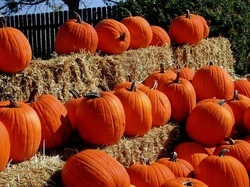 The Stanton Road Pumpkin Patch was founded by Andrew and his son Nathan Matanic in 2011. We decided to open this pumpkin patch after not being able to find decent sized and shaped pumpkins to carve for Halloween. After a lot of research we chose an advance hybrid variety that produces 18 to 30 pound pumpkins with a dark green stem.